Have a Happier and Healthier Hanukkah! Latkes are a traditional Hanukkah staple food—shredded potatoes lightly fried in oil and normally served with a side of applesauce. 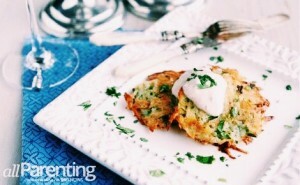 While these little potato pancakes are delicious, they can also wreak havoc on your diet. We came across a recipe for latkes with a kick on allparenting.com that’s healthier; it’s less greasy, less sugar and it includes Greek yogurt (our favorite!). In a small bowl, stir together the Maia yogurt, chipotle pepper, adobo sauce, lime juice and salt. Set aside. Preheat your oven to 450 degrees F, and prepare 2 large baking sheets covered in canola oil. Shred the potatoes; add them, along with the green onions, cilantro, egg, flour, salt and pepper, to a bowl and mix together. Place the prepared baking sheet in the over for 5 minutes. Using about 2 tablespoons of the potato mixture for each pancake, drop the pancakes onto the hot baking sheet and press down slightly to spread out the pancake. Bake until the pancakes are golden brown on the bottom, about 12 minutes. Flip the pancakes and bake until they are brown on the other side, about 6 minutes. Repeat with the remaining potato mixture and the second baking sheet. Serve hot with a dollop of chipotle Maia yogurt on top and enjoy!